Queues began forming outside the Electric Ballroom in Camden late at night following mounting speculation of a surprise performance. The multi-instrumentalist wearing a dark hooded sleeveless top appeared on stage shortly after 12.30am backed by his new 3rdeyegirl band. He opened with a slowed-down version of I Could Never Take The Place Of Your Man. The gig, showcasing new material from his forthcoming Plectrum Electrum record, lasted for around half-an-hour before drawing to a close. He told the crowd of less than 300 people: "You sound like ten thousands. We love each and every one of you." 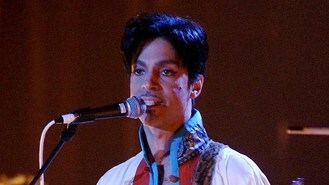 Prince and his band left the stage briefly before returning to say: "We'll be back tomorrow." He is expected to announce a number of UK tour dates today. The enigmatic star flew into London yesterday to promote his new album recorded with the all-female trio. Details of his tour still remain scarce but Prince said he hoped to play "iconic" venues along the lines of music club the Bag o' Nails, where Jimi Hendrix once performed, and Ronnie Scott's jazz club. Before the start of the gig at Camden's rock venue, he first stopped at the east London home of British soul singer Lianne La Havas who met Prince last year while she was touring the US. In her cozy living room in front of a crackling fire, the band played two acoustic tracks of what Prince called their "funky rock 'n' roll," including the newly released single PretzelBodyLogic, the Associated Press reported. He added that he hoped to record the band live during their stay in London, as well as buying "some clothes - and some tea".